We are all too familiar with stories about reductions in library hours, library closures, staff layoffs, canceled children’s programs, and reduced materials budgets. While many readers may not remember, similar stories appeared in the media throughout the 1990–1992 recession. As cruel as that recession was, today’s recession is even worse. In the words of ALA President Roberta Stevens, our profession is confronted with a “perfect storm of escalating costs, shrinking financial resources, increased demands for service, and surging usage.” For all of these reasons, now is a crucial time for all librarians to promote library advocacy. Our advocacy efforts must convince officials that libraries are essential and critical community services. Otherwise, like other services perceived as worthwhile, library budgets will suffer greater cuts than services seen as critical. One of ALA’s responses to the 1990s recession was to organize a “Rally for America’s Libraries / Caravan on Wheels,” that traveled from Atlanta to Washington, D.C., after the 1991 ALA Annual Conference. 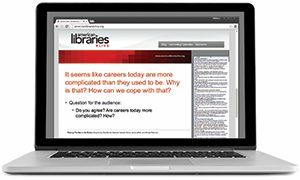 Designed to capture media attention, its objective was to encourage librarians to tell their stories to local news outlets. How it managed to get off the ground, however, is a story in itself, and the lessons we learned then are still relevant today. When I became ALA President in 1990, I was focused on issues concerning reading and children, in line with my presidential theme, “Kids Who Read Succeed.” I confess that I was slow in responding to the budget crises that many libraries were facing. Advocacy was simply not on my agenda. Fortunately for me and libraries in general, Patricia Schuman was elected ALA president to succeed me and her theme was promoting library advocacy. Patricia began working with ALA’s Public Information Office (PIO) to expand its ability to engage in outreach initiatives. We quickly decided to work together to improve the effectiveness of ALA’s communications. One of our first steps was to enter into a contract with Susan Silk of Media Strategies in Chicago. On October 6, 1990, Patricia and I held our first meeting with Silk, Associate Executive Director for Communication Services Peggy Barber, and PIO Director Linda Wallace to plot new communication strategies for ALA—which included some serious media training for ALA presidents. That was an education in and of itself. That conversation haunted me for months, because in my heart I believed that ALA and its leaders, including myself, were too passive. So just before the Spring 1991 Executive Board meeting, Patricia and I had dinner together and talked about the funding crisis and how we might respond. Before our food even arrived, we came up with the idea to organize a rally in conjunction with the 1991 ALA Annual Conference in Atlanta. We would use the occasion to speak out on behalf of libraries. Later, Patricia’s publishing partner Jack Neal suggested we announce a “March from Atlanta” to Washington as a way to attract media attention. His idea appealed to us, because we knew that the White House Conference on Library and Information Services was scheduled to begin just five days after the ALA conference. We also knew that a physical march was logistically impossible—and some people hearing the word “march” might think it too politically charged with civil rights overtones, especially with an Atlanta starting point—but the idea was still seductive. Then on May 6, Sue Silk suggested that a whistle-stop tour modeled on Harry Truman’s 1948 campaign train might do the trick. Instead of a train, we would substitute a bus. Sue was convinced that a combination Atlanta Rally and Bus Caravan on Wheels would be embraced by the media. Her judgment proved prophetic. May 13 signaled the beginning of a hectic and sometimes chaotic six weeks that culminated with the rally on June 29, followed by the Caravan on Wheels. When we first broached the idea to senior ALA staff (Patricia was on speakerphone), I was met with a stony silence; you could cut the tension in the room with a knife. Midway through that meeting I was still not sure of the outcome, but Patricia and I held our ground and insisted we would push ahead with or without ALA staff support. It was a good bluff, because there was no way we could have accomplished our goals without staff support. As we sat around the table staring at one another, Chapter Relations Office Director Gerald Hodges suddenly blurted out: “We can do this, yes, we can!” It was like a dam bursting; almost immediately the staff began strategizing about what needed to be done. The staff’s initial reaction was understandable, considering that the meeting took place only a few weeks before Annual Conference; moreover, ALA’s budget had also been reduced. And here we were asking staff to go into overdrive. It has always given me a great deal of satisfaction that once the decision to push ahead was made, the ALA staff moved quickly and smartly. ALA Executive Director Linda Crismond was very supportive and provided leadership at the senior level. The close relationship that was forged between PIO and Media Strategies was also critical. It was essential that we get the word out to ALA units and related library associations, organize visits to libraries along the bus route, tackle the logistics required for the rally, and connect with the media. All this had to be accomplished in a little more than six weeks. The question of who would pay for the bus caravan quickly became a thorny issue. The ALA Executive Board declined to allocate funds for the project—no surprise, given the state of ALA’s budget and the perceived risk of the project. It was disappointing and frustrating, however, that several board members actively opposed the project itself and did what they could to undermine its success. What occurred during the next six weeks is a separate story unto itself. The rally was widely welcomed throughout the profession, although a small circle of influential public librarians tried their best to undermine the effort. Some opposed the concept because they were fearful that it would provoke a backlash from the officials who had cut their budgets. This fear proved to be totally unfounded. My selection of Jesse Jackson as the opening speaker for Annual Conference also raised concerns. Although largely unspoken, it was hard to ignore comparisons to the Civil Rights Movement. Although such attitudes infuriated us, we didn’t want to get bogged down, so we simply ignored the naysayers and pushed ahead. We kept firmly focused on our goal to celebrate libraries, not bash politicians or get involved in partisan politics. With this in mind we took the advice of Charles Beard, a friend and influential librarian at West Georgia College, who suggested that we invite Newt Gingrich to join Jesse Jackson at the rally. Both politicians proved to be outstanding supporters of our cause. The Atlanta Rally proved to be an amazing success. Outside, under a wilting southern summer sun but energized by the enthusiasm of the crowd, Patricia and I shared the podium with Jesse Jackson, Newt Gingrich, author Judy Blume, Kansas City Chiefs football star Derrick Thomas, and Dances with Wolves author Michael Blake. Stealing the show was Diane Francis, a student at the Adult Learning Center of the Queens Library in Jamaica, New York, who sang an original composition, “Bluffin’ It,” about how the library changed her life by teaching her how to read. Our Bus Caravan was equally successful. Each of the six stops between Atlanta and Washington (in South Carolina, North Carolina, Virginia, and West Virginia) attracted public officials and many library supporters. Several public officials made commitments to their libraries on the spot. Most importantly, thanks to Sue Silk and her assistant, we were met by local reporters at each stop along the way and on our arrival in Washington. Right from the beginning, Patricia and I structured our plans so that there would be a seamless transition from my presidency to hers. Silk correctly predicted that our efforts would create new opportunities for ALA officers to speak out. And we did. My exposure was minimal compared to what Patricia enjoyed throughout her presidency. Her success was especially satisfying because it confirmed that we were on the right track in dealing with the media. This is what Patricia and I learned from the experience and why it is relevant today. Lesson One. Officials will support libraries if you explain how they are serving their communities. It helps if the message is reinforced by librarians at the national level. Lesson Two. The rally garnered extensive news coverage. The diverse new media of the 21st century are also interested in the health of libraries. The trick is to find different ways to capture their attention. Lesson Three. New ideas frequently provoke criticism and opposition. The climate for innovative ideas might be more receptive today, but it is wise to be prepared for naysayers. Lesson Four. There is a subtle difference between media awareness and public awareness. Many of today’s advocacy efforts are designed to make the public more aware of the services and programs at libraries. Our goal was to tap into major media outlets to let them help us tell our stories. Lesson Five. It takes time to build momentum. Patricia and I were successful in part because we decided early on to work together as a team. Each president only has a limited time to pursue his or her interests. By working together with a common purpose, we gained nearly a full year to plan and carry out our advocacy efforts. If ALA presidents work together with immediate past presidents, presidents-elect, and divisional presidents on a consistent advocacy message, it will strengthen the Association’s leadership role as a champion for public, school, and academic libraries. Lesson Six: Using an outside media consultant proved quite effective. Media Strategies had experience working with TV, radio, and print media. They knew how to cut through red tape. PIO is much better prepared to conduct a media campaign today than it was 20 years ago, but we should still consider outside expertise. Lesson Seven. The initiative must be positive and unique. Moreover, we need to speak with a single voice. This means we all must fly under the same banner with a message that embraces all types of libraries. This single message must be flexible enough to enable libraries to tailor it to fit their local needs. Since the rally 20 years ago, ALA has made great strides in promoting advocacy for libraries. We now have an expanded Public Information Office and an Office for Library Advocacy. The @ your library theme and the other programs carried out since 2001 by the Campaign for America’s Libraries have been effective. Several programs currently supported by funds raised through the Champions’ Program also contribute to library advocacy efforts. These include the “I Love My Librarian Award,” collaborative projects with Woman’s Day magazine, and a new partnership with Scholastic Parent & Child magazine and the Lifetime Network for “Connect with Your Kids @ your library” public service announcements. ALA presidents have used advocacy in their initiatives, among them Leslie Burger’s “Libraries Transform Communities,” Jim Rettig’s “Advocacy on Behalf of All Types of Libraries,” Camila Alire’s “Frontline Advocacy,” and Roberta Stevens’s “Frontline Fundraising,” “Our Authors, Our Advocates,” and the “Why I Need My Library” contest. These are all meritorious programs, but we need a catchphrase that continues beyond each president’s term and commands the attention of the media. I still like the catchphrase we used for the Atlanta Rally: “Libraries Are Worth It.” It is easy to add reasons why are libraries worth it. My interest in advocating for the profession was rekindled a couple of months ago when I learned about American Association of School Librarians President Nancy Everhart’s Vision Tour—her initiative to promote school libraries. She is striving to celebrate outstanding media centers in as many states as possible during her presidency. Her initiative is unique, positive, and addresses one of the country’s high priorities: education and literacy. Here we have one “voice in the wilderness” traveling by automobile and airplane, assisted by her husband who often shares the driving. When she rents a car, Nancy slaps a Vision Tour decal on the side. Her efforts proclaim how progressive school media libraries contribute to the education of K–12 students. The Vision Tour, which winds up in New Hampshire on May 19, is, in my opinion, a superb advocacy effort that ALA and its divisions could have supported but failed to do so. 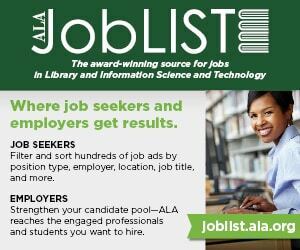 It is time to commit the full array of ALA resources, including support from the Library Champions’ fund, and if necessary, money from the Endowment fund, to a program that will focus media attention on the contributions of all types of libraries. We need to rally around one message and speak with one voice. RICHARD M. DOUGHERTY is professor emeritus at the University of Michigan School of Information and served as ALA president in 1990–1991.